Being able to hire great developers quickly is one of the biggest challenges facing tech companies today and is notoriously difficult to do. Given how important of a role that developers play in a company, being able to hire the best developers is critical to the success of your business. Most top developers are already in employment and might not be actively looking for a new role. Even developers that are looking generally don’t have the time or energy to read through recruiter spam and repeat to each different recruiter as to what they are looking for in their next role. From personal experience and from talking to other developers, I have come to realise that this is the hardest part of looking for a new role and is one of the main reasons why developers are not as active as they could be in seeing what new opportunities are out there. This is the case even though they may be interested in speaking with companies if the right role was to land on their lap. As a company, you therefore need an alternative way to attract “passive candidates” without having to hire a recruiter to spam them. Autocruit solves this with our job video and job audio functionality! 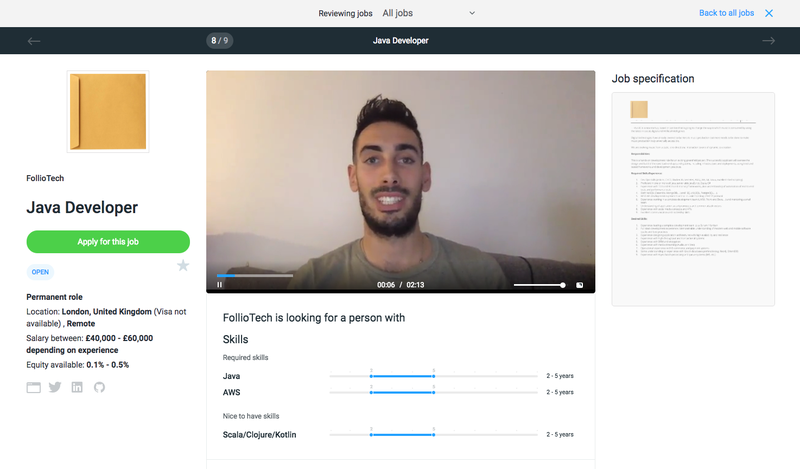 As part of the job upload process on Autocruit, we provide the ability for a company’s CTO/Tech Lead to record a video/audio clip where they can talk about what is involved in the role, the tech stack, upcoming work, the structure of the team and so on (i.e. all the information they would give to candidates during the traditional first stage phone screen interview). These features massively benefit candidates as it allows them to view information upfront (and in their own time) about what is involved in the role. This is considerably easier and much more attractive than the traditional method of replying to a buzzword email from a recruiter, and then taking a call from the recruiter who asks them about their background, what they are looking for in their next role etc and then finally reveals the company name after 5 minutes into the call! A candidate then has to decide whether they want to apply for the role based off this call with the recruiter. The video/audio clip comes directly from the CTO/Tech Lead and not via a commission driven recruiter. This adds far more accuracy and integrity to the information. The job video on Autocruit is recorded through a webcam. It is philosophically much different than a professionally shot marketing video about the company. Each job video is “role specific” and enables companies to provide candidates with a complete overview of the role. Traditionally, companies would not have been able to give this information to each candidate until their first-round phone screen interview. Screenshot of a live job on Autocruit. Using Autocruit for your hiring radically improves your chances of attracting the “passive candidate” as it is far less work for them to view your job on Autocruit compared to going through a recruiter. 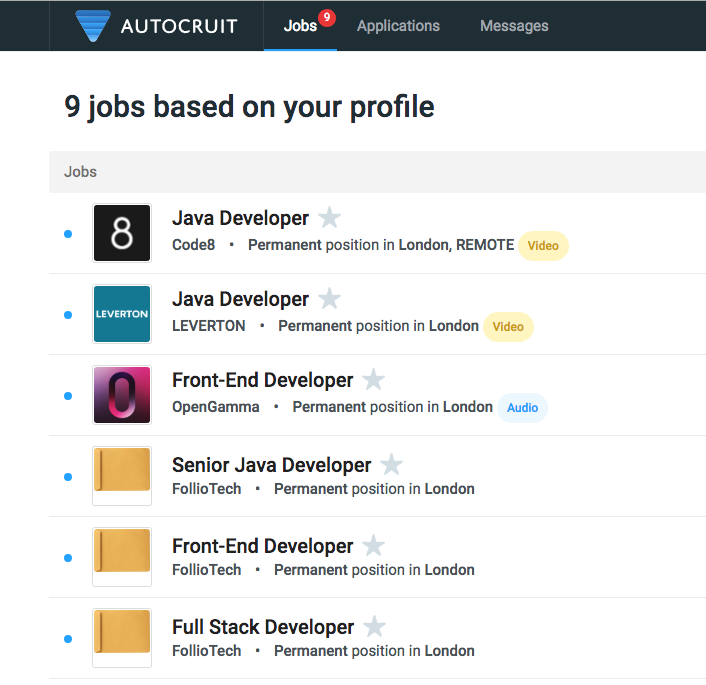 They might not be actively looking but the engaging nature of the jobs listed on Autocruit means that they can sign up out of interest just to see what other companies are doing. They could review 20 different roles on Autocruit in the one free evening they might get in a month and see something that could tempt them away from their current role. To get the same level of detail for 20 roles outside of Autocruit, they would have to go through multiple recruiters and multiple first stage phone screen interviews with the companies. This would literally take months. Screenshot of a candidate’s job list on Autocruit. Each job on Autocruit has a tag associated with it to let the candidate know if the job contains a job video or a job audio clip. From the screenshot above, it is clear that the jobs with a job video or audio will get much more views than the ones without! Of course, for a candidate to benefit from the job video and audio features, it stands to reason that the jobs themselves must match the candidate’s skills and interests. This is guaranteed by Autocruit’s matching algorithm. $99 per month per job with a cost of $1,000 per hire (regardless of salary!). We also allow an unlimited number of applicants for each role for NO extra cost. No strings attached. It’s that simple! If so, then head over to www.autocruit.io to sign up! CEO & Co-Founder of Autocruit. The world’s first recruiterless recruitment platform for developers.